My teenage daughter had dinner with some friends at a Thai restaurant recently. She loves Thai food and was looking forward to the meal as well as the company. She ordered Thai beef salad and thoroughly enjoyed but said it was a bit too hot for her taste. We are all fans of Thai food but can't hack the heat sometimes. It is the birds eye chillies that they use that can leave bit of sting on the tongue. 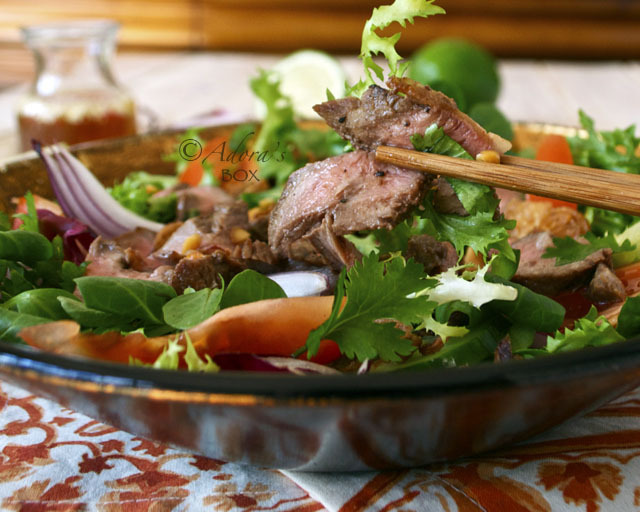 For the very reason that I make my own green curry paste, I do my take on Thai beef salad. This is a simplified version, made with your normal supermarket ingredients but still captures all the essential tastes in the original dish. 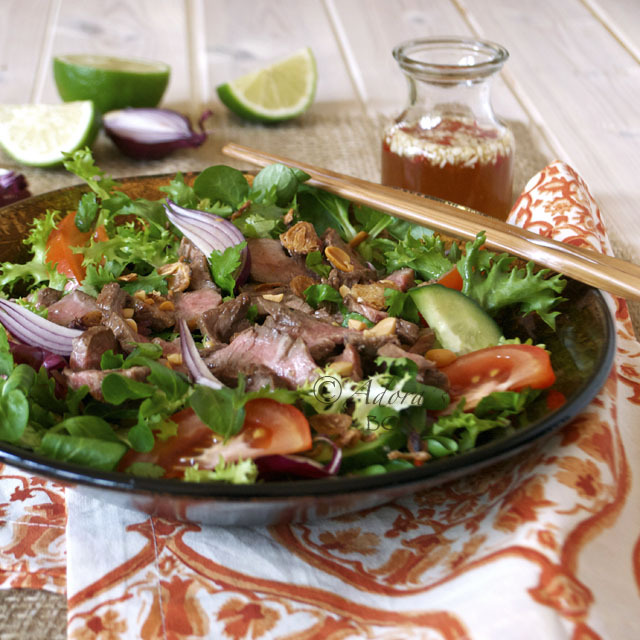 If you have leftover steaks (I know that hardly happens) or roast beef, then you are just minutes away from enjoying a flavour packed salad. Did I say that it is low fat? Apart from the 1 tbsp. of oil in the marinade, the rest is fat free. Just make sure you trim off the fat from your meat. Hearthy, healthy and really tasty. This recipe makes 2 main or 4 starter or side portions. Cut diagonal slashes on the steaks, 1/2" apart. Turn over and cut diagonal slashes, going in the opposite direction. Mix the rest of the ingredients and use as seasoning for the steaks. Pre-heat the barbecue, grill pan or grill. Cook the steaks on high heat to your desired doneness. Leave to rest and cool. Slice, against the grain, into thin strips. 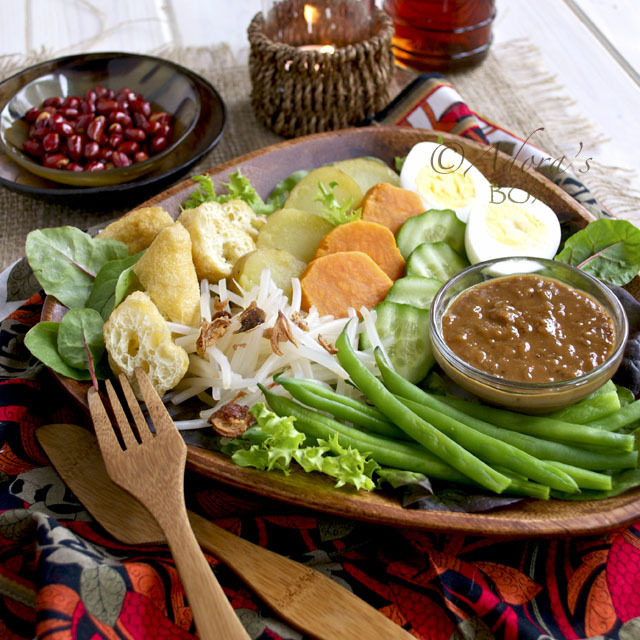 Mix all of the ingredients together and use to dress the salad. Divide the salad greens into 4 portions. Top with the tomato, cucumber, onion and beef slices. Drizzle each with a quarter portion of the dressing. 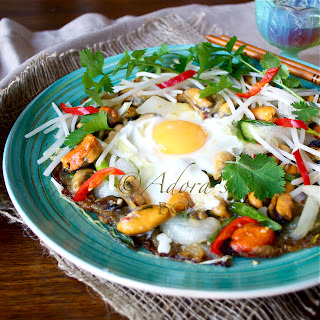 Sprinkle with the coriander, crispy onions and peanuts. I truly adore your page Adora...I think it is the most appetizing and well thought off recipes I can ever get my hands and eyes on..Thank you for the inspiration that you give your fans...most specially for me with the Filipino twist of flavors...My grown up kids are fans as well..!! 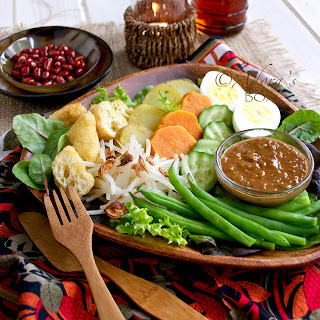 What a wonderful salad! When we grill ribeyes, we always grill two. The first night we split one of them and then save the other for a steak salad a couple of days later. 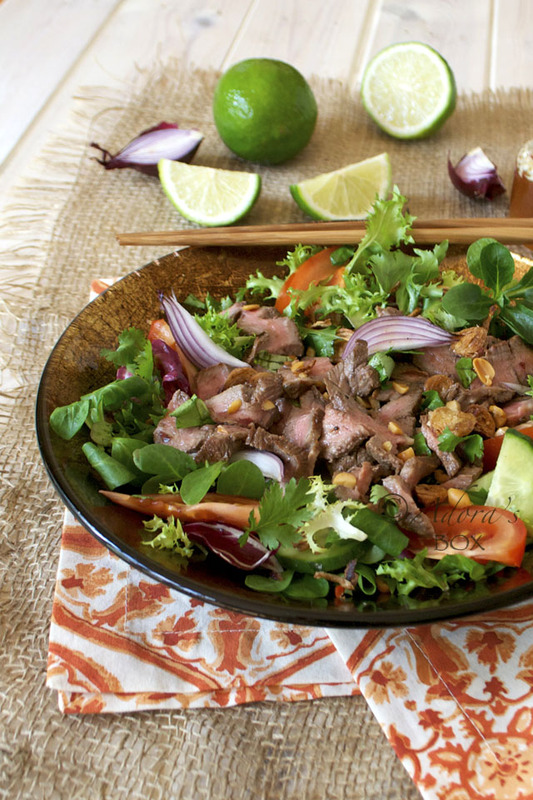 I've never made a Thai steak salad, but that's about to change. Love the seasonings and the beauty of this salad!!! Looks delish Adora! This will be in my recipe box for sure. YUM! I want to make this tonight! Beef for my boyfriend and tofu for me!! !